I wish I could only add smell to an article. If that were possible I would add the wonderful smell of the Kip Gallery Piripiri chicken. The instant you encounter this smell you will want nothing else but to devour at least a whole chicken. The Kip Gallery is a tiny restaurant which specializes in nothing but chicken (kip in Dutch). 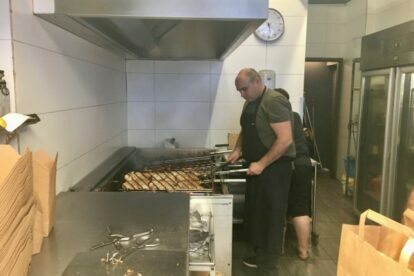 They serve (whole or half a) chicken grilled on a charcoal BBQ, accompanied by fries, rice, corn or salad, and drenched in their famous Portuguese garlic/piripiri sauce. The food is simple but excellent! The mission of the owners is to serve authentic, high quality, slow, soul food for a reasonable price, a mission in which they well succeed! The prices are super reasonable. A whole chicken will set you back €9.30; for a whole chicken accompanied by two side dishes you pay only €12.10. Around dinner time the place is usually packed – last time I was here people even had to wait outside. While waiting you see all kinds of people coming in their weekly (or daily?) dose of chicken, a lot of them obviously regulars. There are a couple of small tables inside and in front of the shop, so you can eat in if you want (afterwards you will smell like a BBQ chicken yourself though), I usually choose for a take out!